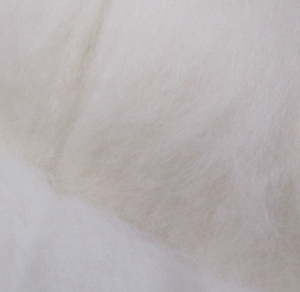 ﻿ Chinese White cashmere Fibers from Weaver Creek Fibers, wholesale purveyors of luxury fibers. This downy fiber is bright white and buttery soft and is the finest available to spinners, with a staple length that makes spinning a pleasure. It takes dye very richly and is shimmery. We recommend that you give this cashmere lots of twist, when spinning and plying. You will be rewarded with a springy and strong product that will bloom into the most luxurious yarn. Our Chinese White Cashmere is cleaned, dehaired and combed.